Jane is still in London when she sends word to Tarzan to make up some of the medicine for jungle fever. Heading out with Boy across the desert they run into some no good guys trying to capture a horse. Shooing them off they make the acquaintance of a female magician on a mission for a sheik. They all end up in a city where the no good guys are holding sway over the local ruler. 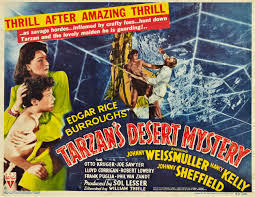 Tarzan and the magician end up in trouble and it isn't long before there is a chase into the desert which ends in a jungle where giant monsters lurk (don't ask just go with it). Good action adventure sometimes gets a bit side tracked, however when its on point it's solid entertainment, even the giant monsters which come off as pure hokey fun. Both films are on the first DVD of the second box set of films of Johnny Weismuller films put out by MGM. When my Dad and I put the films on the other night we did so with the intention of just watching one but we had such a good time with Tarzan Triumphs that we watched the next one. I suspect that if you pick up the box set and you pop the disc in you’ll end up watching them in sequence as well.